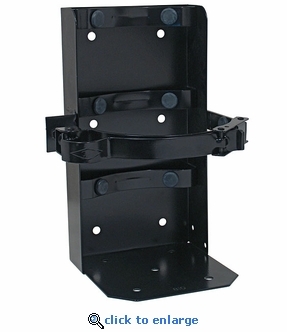 The Amerex 810 Heavy Duty Vehicle Bracket is designed to work with most 20 lb. portable and 2.5 gal. water pressure fire extinguishers in a variety of vehicle and marine applications. Holds extinguishers with a 7" dia. cylinder. Amerex fire extinguisher brackets are quality manufactured of steel with a primed and powder coated paint finish. The paint finish assures many years of use and meets the latest UL salt spray requirements (240 hrs. @ 20% salt solution – ASTM B117). Holds extinguishers with a cylinder diameter of 7". Also works with Badger, Ansul, Buckeye and other fire extinguishers with the same cylinder diameter. Bracket Mounting Holes: 7/16" dia. Mounting screws or bolts not included.